One of the most unusual and extravagant towels in our pattern offer, the Sherwood towel will certainly add glamour to your bathroom. Quintessentially British, this piece is fit for the grandest of stately homes. Featuring traditional fleur-de-lis, this elegant design catches the light beautifully, revealing hidden details. Available in three gorgeous shades, the rich colours are enlivened by the velour finish and the subtle fade out effect creates both depth and texture. This towel is perfect for those with more sophisticated tastes. Browse below to see the variety of shades on offer. 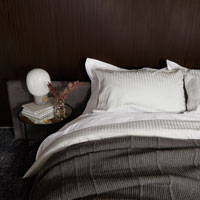 Thanks to the jacquard weave, this design is certainly durable. It will hold its shape after multiple washes, keeping the lines lovely and crisp looking. 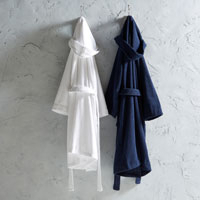 Furthermore, the velour finish, which is achieved by cropping the loops of a terry towel, provides a smoother finish that truly helps the pattern pop. 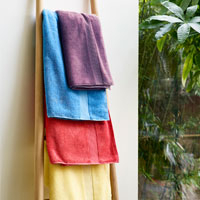 Made in Portugal from 100% cotton, this towel boasts a 550 GSM, perfect for luxuriating in. If you are drawn to this more opulent jacquard style, we would recommend that you have a look at the Christy Versailles towel. This would be a brilliant way to add some lighter tones.